Biological contamination can pose serious health risks and consequences. Failure to appropriately and promptly remediate bio-hazardous substances can result in an unsafe and hazardous environment to anyone in the contaminated location. 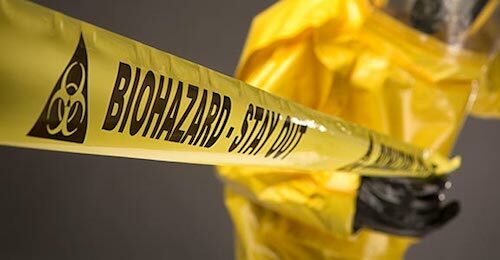 Biohazard Cleaning Australia operates nation-wide and employs trained and experienced biohazard and forensic cleaning technicians with the appropriate knowledge and skills to safely and effectively Clean, Sanitise and remove biohazard contaminated contents safely from site. Equipped with the essential safety apparatus and specialised sanitisation chemicals, Biohazard Cleaning technicians are on-call to assist with the decontamination and remediation of any unsafe environment, leaving a clean and safe area space, safe for re-habitation. Biohazard Cleaning is dedicated to each and every emergency and provide a rapid response with professional and skilled technicians available across Australia 24 hours a day, 365 days of the year. We believe our clients deserve the highest quality of service provided with dignity and respect. As such, we use discreetly marked vehicles to maintain privacy and will document the work we perform in a detailed report provided at the completion of each and every job for your insurance company and personal records. We appreciate that not only are these situations unexpected and upsetting, but they can also be dangerous to deal with and difficult to clean. The biohazard cleaning service we provide is more than a cleaning regimen. When it comes to biohazard cleaning services, our commitment to training, safety and professionalism is second to none. By choosing Biohazard Cleaning, we will provide you with the assurance that trained and competent remediation technicians are performing our service 100%, guaranteed. BIOHAZARD CLEANING SERVICES ALL LOCATIONS IN AUSTRALIA. NO REGION IS TOO REMOTE. A biohazard is a term used to refer to any biological material including microorganisms, plants, animals or by-products that pose a threat. Examples of biohazards can include bacteria and viruses, medical waste, human and animal blood and blood products, body fluids, microbiological waste and pathological waste. Found almost anywhere including at the doctors, shopping centres, homes and hospitals, any potential biohazard should be treated with great caution. Contact Biohazard Cleaning today for a prompt, comprehensive and reliable Biohazard Cleaning service Australia-Wide. No region is too remote.